Though some causes of gum recession may seem like minor concerns, receding gums can lead to serious damage to the roots of the teeth. In order to prevent unnecessary damage or decay, our dentists can rejuvenate receding gums to adequately cover and protect the teeth. Traditionally, extensive gum grafting surgery was used to reverse the effects of gum recession. However, at Austin Dental Spa, Dr. Jordan Slagter now employs a minimally invasive procedure called Pinhole Gum Rejuvenation™ to maximize comfort and minimize recovery while correcting this common condition. Invented by John Chao, DDS, the Pinhole Surgical Technique™ (PST™) is performed without incisions or stitches while also eliminating the need for painful grafting. Instead, Dr. Slagter can create a tiny pinhole in the gum tissue, allowing this tissue to be repositioned over exposed areas of the teeth that have become susceptible to damage or decay. In addition to the oral health benefits of the procedure, Pinhole Gum Rejuvenation™ can give your smile a renewed, beautiful appearance. For more information about this revolutionary gum recession treatment, please contact our office today. When a patient comes to Austin Dental Spa in need of a tooth replacement, our dentists provide a thorough explanation of each option to help them fully understand what to expect. While solutions like dentures and bridges can be great solutions for many people, dental implants are especially beneficial for many reasons. Instead of a restoration that simply sits on top of the gum line, an implant actually replaces the tooth’s root for a secure, permanent replacement option. As a result, patients can experience a number of advantages compared to alternatives. Dental implants can be used as a single tooth implant or to anchor dentures, depending on the needs and goals of the patient. 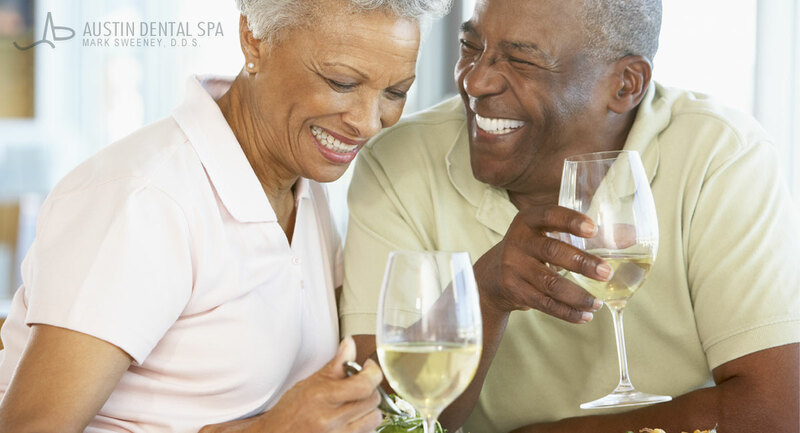 If you would like more information about implants and how they can improve your oral function and aesthetics, please contact us today to schedule your consultation. Additionally, you can visit our dental implant candidates page to learn whether you may be eligible for the procedure. Dr. Mark Sweeney and his Austin cosmetic dentistry practice have announced they will be offering the latest tooth filling technology from Kerr®, Sybron Dental Specialties, called the SonicFill. A bulk fill composite, Dr. Sweeney says the new filling material is ultrasonically vibrated into the tooth and can offer immense benefits to patients including minimal to no post-op sensitivity during dental fillings in Austin. An innovative ultrasonic dental filling from Kerr® dental products, a subsidiary company of Sybron Dental Specialties, Inc., known as SonicFill is now available at Austin dentist Dr. Mark Sweeney’s practice. Utilizing ultrasonic vibrations to apply bulk dental composite filling to posterior restorations, Dr. Sweeney has announced he will be offering the SonicFill to patients at his practice, the Austin Dental Spa (ADS), in the hopes of further enhancing the comfort and effectiveness of his general dentistry procedures. He says he is excited about the new technology as it offers patients significant benefits for filling cavities and other restorative dentistry needs. Through a unique modifier within the composite material that reacts to sonic energy, the SonicFill device lowers the viscosity of the dental filling, allowing for precise and efficient placement without bubbles or gaps. As the energy is removed, the composite returns to an easy-to-handle malleable state for sculpting and carving. Dr. Sweeney says because there is no shrinkage of the material as it hardens, patients experience no post-op sensitivity. He also says the SonicFill composite requires no additional capping layer or incremental layering, ensuring durability, superior adaptation, and a quicker procedure time. Dr. Sweeney says he hopes the new dental filling procedure allows patients a more comfortable and positive dental experience. He also adds that consistent pursuit of the latest, most effective technology is essential to his practice’s ability to provide the highest level of patient care. Dr. Mark Sweeney graduated from the University of Texas at Austin and the University of Texas Health Science Center Dental School. As a member of the American Academy of Cosmetic Dentistry, the American Dental Association, the Academy of General Dentistry, the American Endodontic Society, and several other professional organizations, he has dedicated several hundred hours of continued education and advanced study in dental techniques such as teeth whitening and porcelain veneers in Austin. Dr. Sweeney is also a founding member of the Texas Academy of Cosmetic Dentistry. Located at 3305 Northland, Suite 515 in Austin, TX, Dr. Sweeney’s practice, Austin Dental Spa, can be reached at (512) 380-1300. He can also be contacted online via the website austindentalspa.com or facebook.com/austindentalspa. Who knew getting in full mouth reconstruction could actually be enjoyable? When obtaining dental procedures, you can reflect on the results which can be many good times rather than the chore of getting treatment. In this way, you may be more likely to pursue full mouth reconstruction. Chances are, you’ve been indulging in wonderful treats during the holiday season. If you want to keep your mouth in check, you know you’ll have to make up for it somehow. Besides seeing the transformation your appearance from full mouth reconstruction, you’ll likely experience an over-all sense of well-being following treatment. First, let’s clear this up. What is full mouth reconstruction? Full mouth reconstruction involves bringing your oral cavity up-to-date by replacing old tooth restorations and ensuring that your bite (occlusion) is on target. The end result is a beautiful smile. There are so many reasons to commit to full mouth reconstruction. When you look good, you’ll feel good and enjoy a boost in confidence that will improve your daily life. Healthy habits become easy to achieve as time passes, and the outcome is undeniably worth it. Once you start seeing results (and turning heads) with your new smile, regular dental visits to maintain your appearance can become even more addicting than Grandma’s chocolate chip cookies. We all know that anything rewarding in life is going to take some work, but who says the result won’t be fun? Dentistry appointments twice a year for preventative dental care have increased over years, but there are still many people that postpone preventative dental visits until restorative dentistry is required. The reasons for this may be numerous. Perhaps, such people are not aware that there is sedation dentistry available which alleviates fear, anxiety and discomfort from dental procedures. Alternatively, it may seem that preventative dental visits are cost prohibitive since there are a limited number of dental insurance companies that offer adequate insurance coverage for dental visits. By the same token, restorative dentistry can be very costly, particularly by comparison to preventative dental visits. So, we’d like to alleviate the two common strains for avoiding dentals visits with more detail about insurance constraints and sedation dentistry. Sedation dentistry is offered by a select number of dentists. There are a variety of options available for sedation dentistry. So, it is wise to contact your dentist’s receptionist to convey your concerns about dentistry. Then, your dentist’s receptionist can convey your concerns to your dentist to determine the best approach to allow you to have a carefree experience. Sedation dentistry options are not designed to be expensive, making oral medications, laughing gas or other modalities easy to fit into your checkbook. Insurance is the second important consideration. Many insurance programs are discounted programs that do not provide as much as 50% off on preventive services. Some insurance programs may seem more appropriate, offering comparable coverage to the type of coverage you would find through an employer’s health insurance policy. There are also other dental insurance policies you can purchase online that may be comparable to traditional programs at 80% preventative and 50% for restorative. In the end, even if you decide to purchase a policy before your dental treatment, you can be rest assured that you are far more likely to contain dental costs through preventative dental treatments. Fear tooth loss? You are not alone. The American Association of Endodontists released study results showing that 70% of people in the U.S. fear tooth loss. So, we’d like to tell you what you need to know to help ensure you keep all of your teeth over the course of your lifetime. First and foremost is proper tooth brushing, flossing and regular dental check-ups. Proper diet also plays a role in oral health so check out our oral health diet article. If you lose a tooth due to traumatic injury, you can try to place the tooth back in your mouth after cleaning it with water only as you contact your dentist immediately so you can step into his or her office to see if you can save your tooth. The most important component is to not miss out on dental treatment if you need treatment. Small dental cavities can easily be detected at your dentist’s office with advanced technology. This offers an opportunity to fill in small cavities, preserves more healthy tooth structure and prevents increased decay that would otherwise lead to larger dental fillings, less natural tooth structure, and more invasive dental treatment. More invasive dental treatment, such as, dental crowns and root canals, are required for advanced tooth decay and take away from normal tooth structure. So, proper oral hygiene is the key that unlocks the door for preserving your teeth over the course of your lifetime. Have no fear, see your dentist regularly and learn more about how you can preserve your healthy tooth structures for a lifetime. Stem cell treatment may be new up and coming method for treating problems associated with gum disease. With only a quarter of the population that is free of some stage in gum disease, the idea that stem cells may treat the consequence of tooth loss due to gum disease is quite promising. Traditionally, there is no cure for gum disease. It is a condition that must be managed to prevent the progression that would otherwise lead to tooth loss. Some dentists use bio films treatments to limit unhealthy biofilm layers of bacteria that cause gum disease. Bio film treatment is both preventative to forgo progression and a form of treatment to best to manage periodontal disease. he traditional method to treat the precursor to gum disease is root planing and scaling, as well as, professional dental cleanings more often than the norm. For later stages of gum disease, laser treatment or periodontal surgery may be an option to limit progression. Recently, the results of stem cell research were published in the journal Tissue Engineering. Apparently, UIC’s Brodie Laboratory for Craniofacial Genetics researchers obtained a grant from the National Institutes of Health to extract periodontal molar ligaments from mice to prepare them with stem cell treatment. Once the teeth were replaced in the mice’s mouths, the stem cells triggered new fibrous attachments that firmly anchored the replaced to the bone. These newly formed ligaments were comprised of all the essentials to complete the anchor. The combination of a natural tooth structure and periodontal progenitor cells was successful! The results of the study suggest that a revolutionary method for treating tooth loos may soon be available. Typically, the procedure to follow when a tooth is lost due to trauma is to replace the tooth into your mouth, holding it firmly in place for a few minutes. At times, this may work. Other times, the tooth may not be able to anchor or may be loose. In the end, it’s important to see your dentist fi you’ve lost a tooth as soon as possible. Replacing your teeth with a dental implants, bridge or dentures will prevent your teeth from moving and help to reduce the risk of oral conditions. Just as the old adage implies, Halloween can be a time of tricks or treats. Amidst harmless spider webs, witches, skeletons, pumpkins and jack-o-lanterns, there’s a real increased risk of one trick that we all want to stay away from- tooth decay. Of course, that’s’ not going to prevent children and adults from enjoying this scary holiday. After all, it’s been a customary tradition since the 1950’s. By the same token, since the 1950’s we have learned we need to be aware that candy treats pose a risk for tooth decay. How so, you may ask? Candy is a refined carbohydrate that tends to be sticky and adheres to your teeth. Once candy adheres to your teeth, it stimulates acidic build up on your teeth which can penetrate into your teeth, causing tooth decay. Candy intake also disrupts your mouth’s pH balance, further increasing acidity. According to Dr. Mark Helpin, Chair of Pediatric Dentistry at Temple’s Maurice H. Kornberg School of Dentistry, it requires up to 60 minutes for your mouth’s pH balance to recover from one piece of candy. Dr. Mark Helpin also found that the longer the teeth are in an acidic environment, the greater the risk of tooth decay. In the end, it’s ok to enjoy the holiday with more than one piece of candy in one sitting. But, stay away from indulging in candy throughout the day. If you don’t, your teeth can be gobbled up by the ghosts and goblins of acid and bacteria. Here’s a few more tips to take the trick of tooth decay out of your Halloween. Make Halloween candy the dessert or snack of the day so you and your children don’t have haunting teeth following the celebration. Don’t make candy an all day affair or forget a balanced diet to take the spook out of your teeth. Brush teeth after candy eating or at least rinse your mouth out 3-4 times to help restore pH balance and to limit gory acidity. Try sugar free candy, cracker snack packs and trail mixes for trick or treaters and you’ll be the angel of the evening. Focus on flossing to help take the fright of tooth decay out of your life, it’s also good time to teach children how to floss which will remove candy that is caught between the teeth. Knock on the door of your dentist for a professional dental cleaning when the festivities have come to an end.